This post is part of a 9-step guide to creating a Content Strategy. To return to the landing page for this guide, click here. Next, it’s time to take a look at what your competitors are doing. You want to get an idea of what their strategy is, what type of content they produce, how well it’s doing, and so on. This will help to guide what type of content you should create. By doing this, you’ll learn what works for them and what doesn’t. Maybe you’ll decide to mimic what they’re doing but just do it better. Or, maybe you’ll want to go in a totally different direction. This section will help you decide. Also, be sure to consider not only your direct competitors (those who sell a similar product or service as you) but your Content Competitors as well. What are Content Competitors you say? Basically, a Content Competitor is anyone or company you would be competing with to create content. If you’re creating content for search, you’re competing for that top result on Google for a given keyword. This competitor won’t necessarily be selling the same product as you, however, their customer’s pain points, interests, or so on are the same. This can be companies in the same industry or even unrelated industries that have an overlap in customer interests. For instance, let’s use the fitness space as an example. Let’s say Company A sells fitness equipment including dumbbells, battles ropes, resistance bands, etc.. However, Company B sells supplements like whey protein and vitamins. Although they’re selling different products, both are in the fitness industry and will likely have a similar customer base, thus needing to produce similar content. They are Content Competitors. Or, consider someone searching for “time saving tips”, not only will companies that produce apps, software, or other products for time management be producing content for this keyword, but so will general blogs, lifestyle blogs, and news sites. 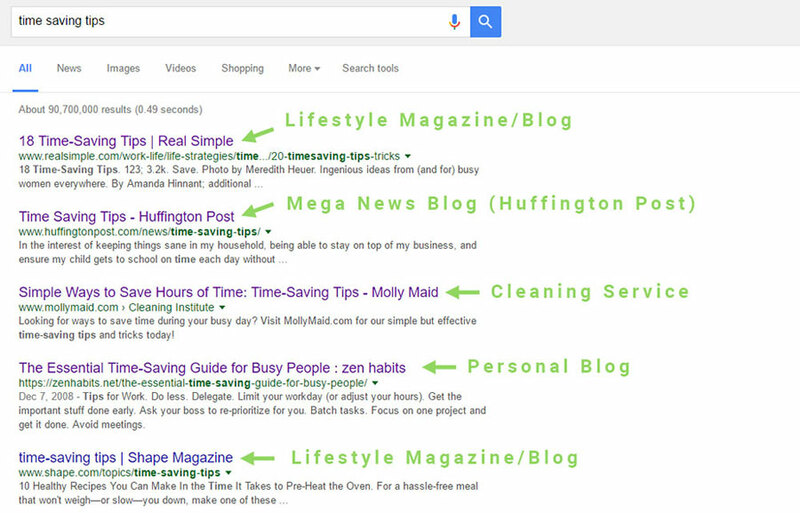 Take a look at the example above, just for the keyword “time saving tips”, there are two lifestyle blogs, one major news blog (Huffington Post), a personal blog, and a cleaning service. Below that (but not pictured) is Lifehacker, Entrepreneur.com, and Small Business Trends. One is a tech blog, and the other two are business orientated news sites. So it’s important to consider who might be competing with you not only on a product or service level but on a content level as well. How crowded is the content space in your industry? Are you ahead of the curve or do you have aways to go? How often do they produce content? 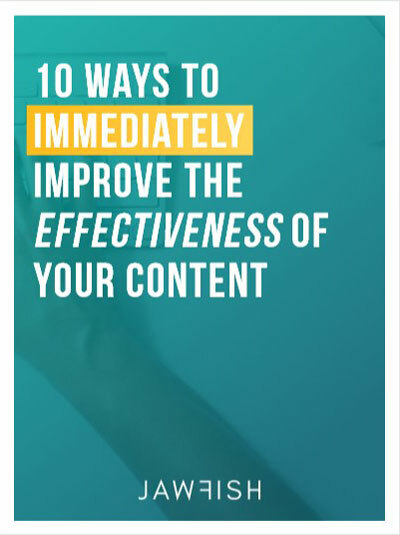 Discover 10 ways you can quickly improve your content's effectiveness with this free guide. What gaps are there? For instance, what content have they not addressed yet? What can you do that hasn’t been done? What can you do better? What’s their Domain Authority or Domain Rating? Domain Authority is basically a metric, developed by MOZ, to gauge the authority of a website. It’s is primarily based on the number and types of backlinks they have. Domain Rating is Ahref’s version of the metric. How many keywords do they rank for? What keywords do they rank for? How many and what type of backlinks do they have? I used Apple’s website as an example. 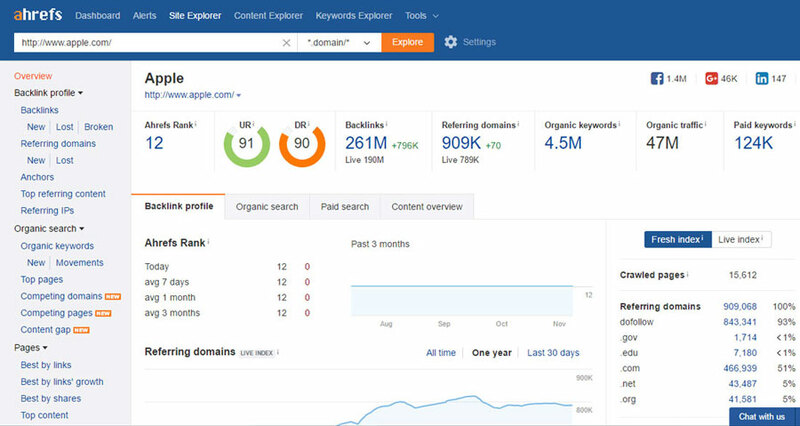 But see in the image above, you can find Domain Rating, the number of keywords the website ranks for, the amount of traffic, the number of backlinks they have, etc. How many followers do they have? What days and times do they typically post? By analyzing your competitors, you can even further begin to understand your customers. You can also learn from your competitor’s mistakes and avoid producing content that didn’t work. So be sure to do a complete competitor analysis before moving onto the next step. Cody is the founder and owner of Jawfish Digital. 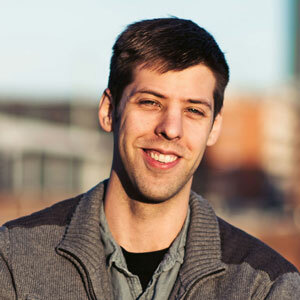 He has over 5+ years of experience in Web Design and Content Marketing. He’s helped create long-form, SEO-driven content for companies such as Instapage, Nutshell, Leadboxer, Wonderflow, and more. How Would You Prefer We Follow Up? What can we help you with? Use as much detail as you can.